During the 24 hours, 13,700 people voted. 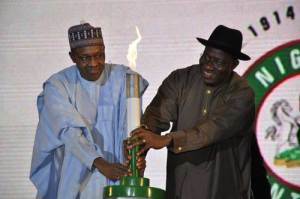 10,280 of those surveyed overwhelmingly voted for General Buhari, giving him a 75% lead. This data mirrors a previous poll in which President Jonathan and Gen. Buhari were matched head-to-head, a pairing that suggested a win for Buhari with 78% of the vote cast. The previous poll prompted President Jonathan’s aide on social media, Reno Omokri, to conduct another poll, with the same pairing. Controversy surrounds that survey because the poll was closed suddenly when the incumbent was shown to be leading by just one point, after trailing Gen. Buhari the entire time. 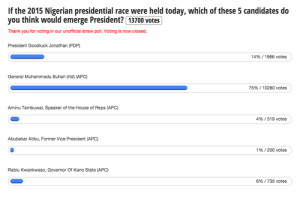 In this poll, President Jonathan received 1,966 votes, a share of 14%. Governor Kwankwaso received 6% of the voting share with 735 votes. Speaker Tambuwal and former Vice President Atiku received 519 (4%) and 200 (1%) of the vote, respectively.